ESCAP, ADB and the Coordinating Ministry of Economic Affairs Indonesia organized the 8th Asia-Pacific Trade Facilitation Forum from the 5-8 September 2017 in Yogyakarta, Indonesia. The theme for this year’s APTFF is Trade Facilitation Innovations for Sustainable Development in Asia and the Pacific. 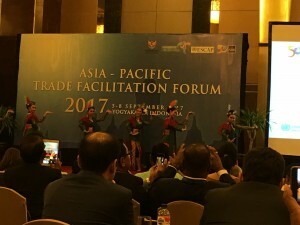 The Asia-Pacific Trade Facilitation is the leading regional platform for the exchange of information, experiences and practice on trade facilitation. The APTFF has been organized by UN ESCAP and ADB and growing number of partners since 2009. The Forum attracts over 250 participants from over 30 countries. This year’s Forum featured panel discussions, interactive sessions and an exhibition highlighting innovations and trends in trade facilitation in the Asia-Pacific region. The Forum also included a number of side-events providing more in-depth exploration of the pertinent trade facilitation issues. These events are held to maximize learning and capacity building on trade facilitation of participants attending the Forum. 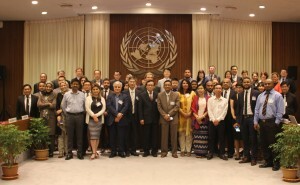 While the nature and number of side events vary every year, they generally include a study tour organized by the host country, as well as technical workshops co-organized with the United Nations Network of Experts for Paperless Trade in Asia and the Pacific (UNNExT), WCO or other members of the Global Facilitation Partnerships for Trade and Transport (GFP). Prof. Xue presented on legal impact of international digital trade at the Session 3 Facilitating Trade Behind the Border: Creating an Enabling (Business) Environment for Cross-border trade on September 6, 2017. She also participated in the UNNExT Advisory Committee Meeting. On September 7, 2017, Prof. Xue moderated the UNCITRAL Side Event “Taking FTA Electronic Commerce Chapters Seriously: UNCITRAL Texts for Mutual Recognition of Electronic Communications and Signatures” and actively contributed to the Panel’s discussion and Q&A. The United Nations Framework Agreement on Facilitation of Cross Border Paperless Trade in Asia and the Pacific (Framework Agreement) has been adopted after three member states of UNESCAP , China, Bangladesh and Cambodia, deposited their signatures before September 1, 2017, the period open for signatures. According to the Framework Agreement, it will become effective after 5 member states ratify it. This treaty is the first regional agreement of its kind to specifically focus on developing digital trade facilitation measures to achieve paperless trade across borders. Open to all 53 member States of ESCAP, the new treaty will support the WTO Trade Facilitation Agreement, which entered into force in February 2017. It is also expected to help harmonize the growing number of bilateral and subregional paperless trade initiatives in the region. Prof. Xue’s paper “The Newest UN Treaty to Facilitate Cross-border Paperless Trade in Asia and the Pacific: An Insight Preview” dedicated to the agreement has been formally accepted for publication on the prestigious SSCI Journal of World Trade and will be availed online and physically in December 2017 in Geneva. Prof. Xue, as the invited legal expert, took part in the both the Legal and Technical Working Group (IISG) meeting and the 3rd meeting of the Intergovernmental Steering Group on Cross-border Paperless Trade Facilitation on the 21-24 March 2017 in Bangkok, Thailand. Significant progress was made on a draft road map for implementation of the Framework Agreement on Facilitation of Cross Border Paperless Trade in Asia and the Pacific. Prof. Xue gave a presentation on the international laws that are essential or complementary to the Framework Agreement at the Working Group meeting and her draft on implementation of Article 10 of the Framework Agreement was officially accepted as the supporting document for implementing the Road-map at the IISG meeting. Senior officials from 26 countries in the Asia-Pacific region participated in the Steering Group’s deliberations. The Steering Group made significant improvement on a draft roadmap which outlines actions for successful implementation of the treaty. The Steering Group also agreed on a signing ceremony of the treaty to be held in August 2017. The text of the new treaty was adopted in May 2016 and opened for signature in New York later that year.